Hungarian-born modern architect and interior designer, Paul László built his reputation especially in Hollywood, while designing interiors for houses. He did not belong to any artistic or design movement, but relied only on his own instinct that was carefully refined. Paul László was born in Debrecen, Hungary in 1900. He learned about the world of architecture and design thanks to his father, who was a furniture manufacturer. He studied design in Vienna and had his technical training in Stuttgart, Germany, where, at the age of 27, he founded a high-level design business that has earned an international reputation. When the Nazis dominated Germany, Laszlo, who was a Jew, escaped to Los Angeles, where he opened an interior design shop. While taking many commercial assignments for American department stores, the tailor-made residential work was the Laszlo warehouse. 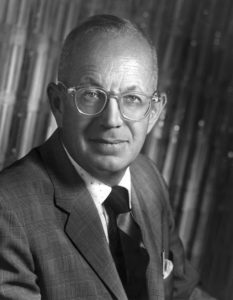 During his life he achieved considerable success thanks to his client list which included well-known characters such as Cary Grant and Barbara Hutton, Barry Goldwater, the Vanderbilt family and Billy Wilder. Although his knowledge of English was very elementary, his reputation was so good that once in America, he immediately began to receive a lot of commissions. During his life, László has obtained a considerable number of prestigious appointments, often for great national stores. In the ’40s, Rene Williams entrusted him with the task of furnishing the interiors of his residence in Beverly Hills, where the designs realized by the Hungarian architect showed his classic distinguishing marks. An example is given by the “Paddle” chairs, extremely proportioned seats characterized by flat and wide namesake arms, a perfect place to rest a cocktail. There was a reason why Laszlo’s work was so admired in the middle of the 20th century: each design contributes to create a comfortable and elegant environment, at the same time robust and relaxed. 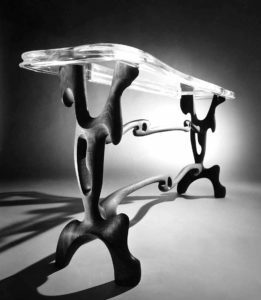 One of Paul László’s most famous works is the “Cocktail Table” designed in 1955 while he was in the USA. 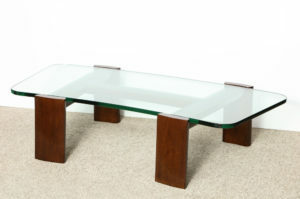 The table is built with a dark stained mahogany material and is characterized by united and abstract shaped elements in the shape of the letter “H”. As for the top, it is made of thick and curved glass and fits perfectly into the structure. In addition, on the underside of the table you can see a metal label containing the designer’s name. László’s style is undoubtedly a cosmopolitan style. He achieved considerable success thanks to his personality and talents that were greatly admired and appreciated by his contemporaries. 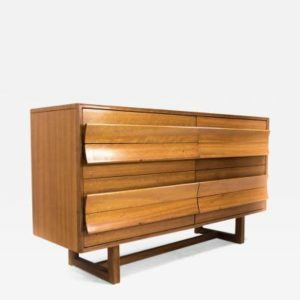 From single pieces of furniture to full lines, from single-family homes to department stores and casinos. His style was simple but at the same time sophisticated and was characterized by warm and organic shapes. His mastery in the use of colors led him to completely integrated projects. The Hungarian architect has always appreciated rich colors, textures, intertwining and comfort. He had a contemporary spirit with modern and neat light elements. 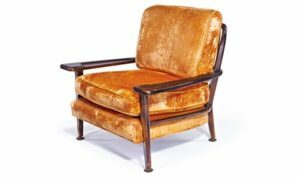 A complete designer, his works and projects of furniture, fabrics and lights have never gone out of fashion, as evidenced by the high prices his pieces dominate in today’s design market. From the late ’30s to the’ 60s, Laszlo’s name was synonymous with sumptuous modernity among the members of the intelligent set. He did not belong to any artistic or design movement, but relied only on his own instinct that was carefully refined.